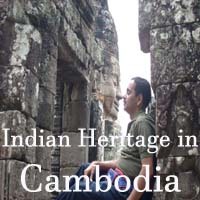 Cambodia is officially known as Kingdom of Cambodia and this country is located in the southern portion of the Indochina Peninsula in Southeast Asia. It is bordered by Thailand in the northwest, Laos in the north, and Vietnam in the east and south, and the Gulf of Thailand in the southwest. The total landmass of this country is 181,035 square kilometers with a population of about 14 million. 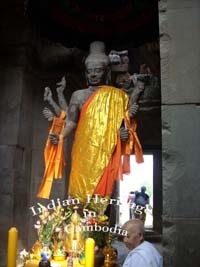 The official religion is Theravada Buddhism, which is practiced by approximately 95% of the Cambodians. Once Cambodia was known as Khmer Empire, it became a protectorate of France in 1863, and later gained independence in 1953. 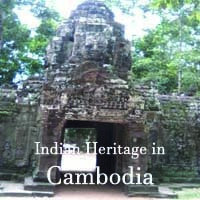 According to a legend, Cambodia came into existence through the union of an Indian Brahmin named Koundinya and a princess, the daughter of a dragon king who ruled over the watery land. The legend says, one day, as Koundinya sailed by, the princess sat out in a boat to greet him. Koundinya shot an arrow from his magic bow at her boat. Struck by fear the princess agreed to marry Koundinya. Her father drank up the waters of his land and presented it to Koundinya as dowry. Thus the new kingdom named Kambuja came into existence. 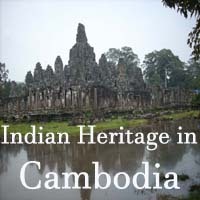 It was the trade with India since 1st century that introduced the Khmers to Hinduism and Buddhism. 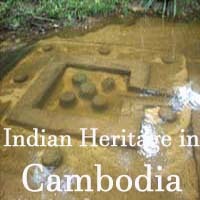 Thus the Khmer art and beliefs directly stemmed from India. 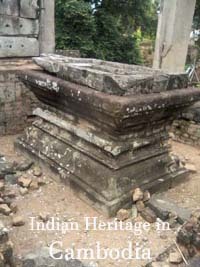 Historical evidence about the Khmer rulers in the form of local inscriptions can be traced upto 6th century. There is a record of a city called Bhavapura with its king Bhavavarman I in the second half of the 6th century. 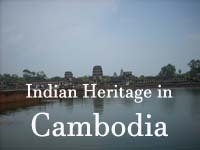 The names of the Kings and cities show the influence of Hinduism on Khmer rulers. Some of the most important cities of that time were Aninditapura, Vyadhpura, Sambhapura, Hariharalaya and Yashodharapura. Some of these names are also related to the names of the Kings, which subscribes to the ancient Hindu theory of ‘Raja Prathyaksha Devatha’ which means the King is the symbol of God. 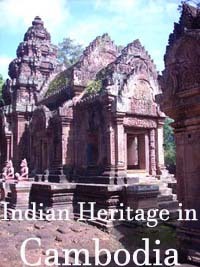 Through the inscriptions and existing temples it is known that the history of Angkor begins in the ninth century starting from Jayavarman II. Angkor is the region in Cambodia which consisted of many Royal places, capitals, state temples and temples built by different Khmer rulers. Most of these are now in shambles but are being restored. 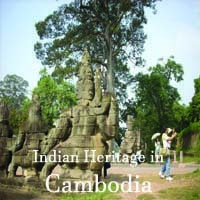 It was the trade with India since 1st century that introduced the Khmers to Hinduism and Buddhism. 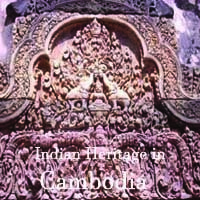 Thus the Khmer art and beliefs directly stemmed from India. There are numerous temples in the Angkor region where the Kings had their base. 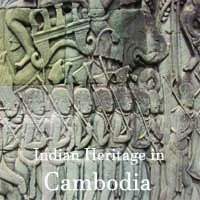 In this volume of photos I have made a few observations and illustrated them with the photographs of different prominent structure of this region. 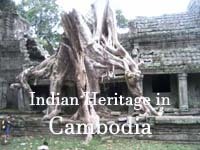 I have documented 24 prominent structures during my seven trips to Cambodia on teaching assignments at Build Bright University, Cambodia. 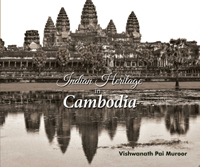 My attempt is to give a brief account of the Indian Heritage spread across Cambodia, which is located in the South East Asia region.